The Bangkok Post has revealed that it was contacted by the Ministry of Information & Communication Technology earlier today, regarding an article by Wassana Nanuam. According to the Post, the Ministry requested the newspaper's co-operation in removing the article, and the Post complied. Consequently, the article has been deleted from the Post's website. 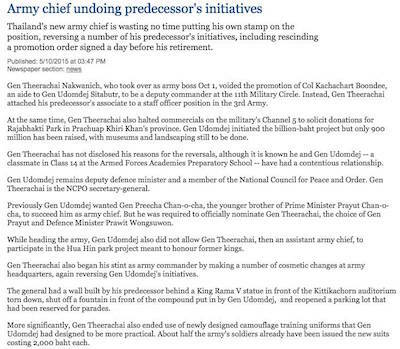 The article highlighted the rivalry between Udomdej Sitabutr (the former army commander) and Theerachai Nakwanich (Udomdej's successor). Wassana has well-placed military sources, so the story is credible. In fact, she has written several similar articles in the Post recently, describing the generals' rivalry in stronger terms, though MICT did not ask for their removal.